Arrive at Sharjah International Airport, meet our local representative and get transferred to your hotel. Post check-in, its time to explore the true beauty and the soul of Sharjah. The tour starts with a photo-stop at the iconic Al Noor Mosque, a reflection of the Arabic culture and architecture. Your next stop is the King Faisal Mosque. Head to the Museum of Islamic Civilization that covers more than 5,000 artifacts from the Islamic culture. As you drive through the city's Old Town and take a stroll down the Souq Al Arsa, the beautiful and hospitable vibes of the city will take you by surprise. In the evening, visit the Heart of Sharjah and Souk Al Markazi - a treasure trove of carpets, jewellery and handicrafts. Return to your hotel for the night. Post breakfast today, the day is at leisure. You can opt for our highly recommended activities and experiences in Sharjah today at an additional cost. A fascinating and entertaining experience for kids is the Sharjah Space and Astronomy Centre. 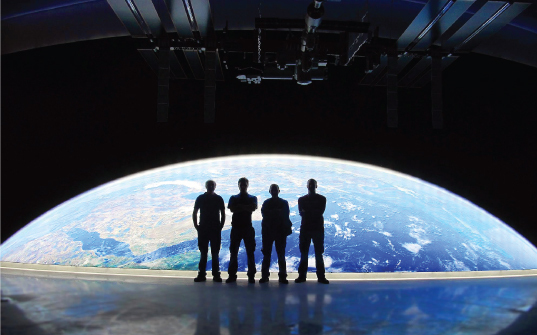 Life at zero gravity and high-tech spacecraft gadgets are the highlights of this centre that is operated by NASA. The centre holds an exclusive show everyday at 1pm. 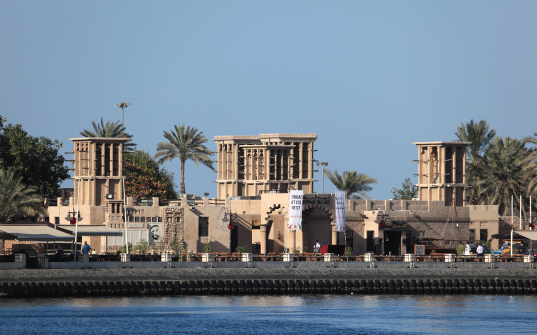 In the afternoon, visit the famous vintage car museum or the Sharjah Golf and Shooting Club. In the evening, head to the city's hotspot, The Rain Room - the art installation where you can walk in the rain but not get wet. If you want to skip these activities, we advise you to explore and shop at the local souqs. Today morning, post breakfast, check-out from the hotel and head to Dubai. On arrival, check-in to your hotel here and freshen-up. Get ready for an exciting city tour of Dubai. Experience the magnificence of the Jumeirah Mosque, the tranquility of Jumeriah beach, one of the most photographed hotels of the world – Burj Al Arab, the stunning Sheikh Mohammed’s palace and towering skyscrapers in Deira. After exploring the top attractions and landmarks of Dubai, return to the hotel in the afternoon. 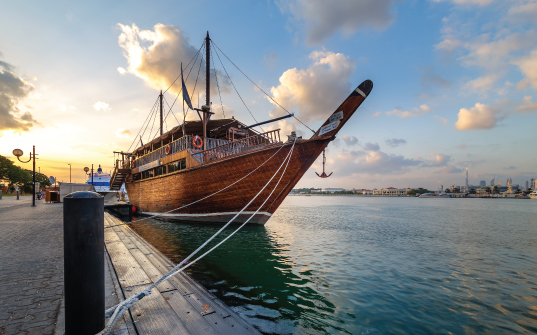 In the evening, it's time to enjoy the traditional Arabic Dhow Cruise. With the romantic sun-down experience, enjoy the relaxing atmosphere, live music and indulge in a delightful cuisine with a view of the old and modern Dubai. After the eventful day, return to the hotel and rest. After breakfast, set off to visit the tallest building in the world, the Burj Khalifa. Catch a glimpse of magnificient Dubai from the 124th floor of this majestic building. You have the afternoon free to hit the famous malls of Dubai and get some shopping done. Later, proceed for a desert safari with barbeque dinner. Desert safari a must-do adventure in Dubai. Experience the desert drives, followed by an exotic Arabian cuisine as you enjoy watching the belly dancers perform. After a cheerful day, return to the hotel for an overnight stay. After a delicious breakfast, check-out from the hotel. Spend your morning at leisure by indulging in last-minute shopping or visiting something you really wanted to catch-up in Dubai. 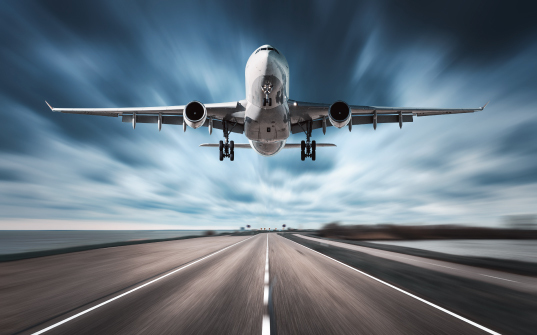 Get transferred to the airport for your journey back home. Above prices are valid for booking till July 31, 2019. Standard check in time in Dubai is 1500hrs and check out time is 1000hrs. Supplement for guaranteed early check in / late check out on will be on direct payment basis. 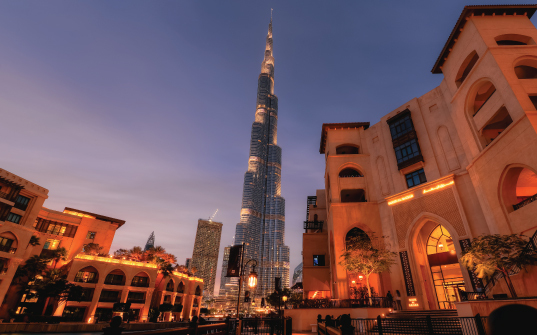 Burj Khalifa visit timings and entry fees are subject to change at short notice. If there is any change in the rate on account of change in peak-hour timings, the same will have to be borne by the traveller. Availability cannot be guaranteed at any point of time. Special requests will be subject to availability; and an alternate slot will be provided in case the requested slot is unavailable. Tickets are non refundable, non transferrable, and no date or time change is permitted once booked. Supplement applicable for travel to and from Sharjah International Airport, Abu Dhabi International Airport or any other airports in UAE. No refund for unutilised services. In case a passenger misses his services, it will be counted as a no-show and the same can be re-booked only at an additional cost. In the event of non refundable package rates payment and cancellation policy will be as per policy at the time of quote.